Who wouldn't want to see famous director Sam Raimi in an 80's low budget throwback to a 70's exploitation/horror/war film? I had heard about Thou Shalt Not Kill...Except by accident a few years ago. I came close to checking out the old Anchor Bay DVD release but never got around to it. Just re-released in a DVD/Blu Ray Combo set by Synapse Films, I had no excuse to procrastinate any longer. Thou Shalt Not Kill...Except stars Brian Schulz as Stryker, an army veteran whose leg was wounded in Vietnam. Now a depressed alcoholic, he meets up with his old girlfriend and tries rekindling their relationship. In the meantime, a group of Stryker's army pals decide to visit him. It's a good thing too, because they will have to band together to fight a new enemy...a satanic hippie cult led by a Charles Manson-esque leader. 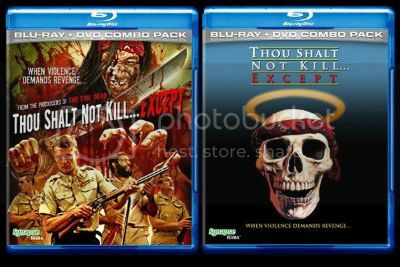 Thou Shalt Not Kill...Except was a fun and gory tribute to exploitation films of yore, when the acting was hammy, the budgets were miniscule and the blood flowed in rivers. The whole cast does a great job, especially Raimi as the psychotic cult leader. There is also an appearance by Raimi's brother Ted as one of the cultists. The story is simple and the characters are interesting. Synapse Films' new release is a revelation for this hardly seen flick. The DVD/Blu Ray combo comes with a bunch of great features including interviews, deleted scenes, reverseable cover art, two commentary tracks and a making-of documentary. The best feature though is the original 8mm film Stryker's War which the film was based on and stars Bruce Campbell as Stryker (he co-wrote the story but was unable to star in Thou Shalt Not Kill..Except due to the fact he had become part of the Screen Actor's Guild). Overall this set is a must have for any fan of horror and exploitation or the films of Sam Raimi.